I introduce you to Part One of my soon-to-be completed winter ensemble of choice. 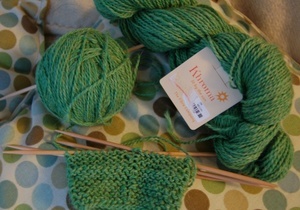 Yarn: Nashua Handknits, Creative Focus Worsted, which is a wool/alpaca blend. In oatmeal color. I just love that as a color. oatmeal. oatmeal. Ordered from Jimmy Beans Wool, 'cause they're just so fast and accomodating (especially for annoying after-ordering mind changers like myself). 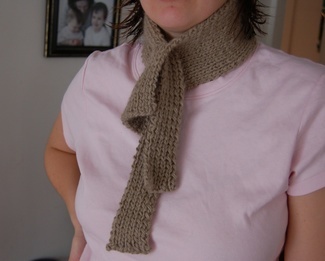 Notes: Very easy, very fun to knit. (Two movies, tops.) I wasn't sure how functional this contraption would be, but I think I'm going to like it--it's not as bulky as a scarf, and it's kinda cute. And now, for a sneak preview of part two. A delectable treat that Steve bought for me for Solstice. It's Khorma, by The Fibre Company, a Portland fiber arts company. I will happily marry these two colors (oatmeal and melon, oatmeal and melon!) to complete the 'ensemble' with mittens and a hat. (sorry--bad light photo). And yes, Steve bought me YARN for Solstice. YARN. GORGEOUS yarn. I love that man.